Statement of the VBKÖ (Austrian Association Of Women Artists) leadership in response to demands from members and former members of the organization for fairer governance, formulated in the Open Statement To The President Of The VBKÖ. To the initiators! To the audience! In the following, the Board of the Austrian Association of Women Artists (VBKÖ) is commenting on the e-mail of November 25, 2011, titled “Urgent convocation of a General Assembly” , and of November 30, titled “Open Statement to the President of VBKÖ”. We sharply reject the false reports and attacks on the incumbent President of VBKÖ, Rudolfine Lackner, launched by the artists Elke Auer, Veronika Dirnhofer, Lina Dokuzovic, Hilde Fuchs, Nina Höchtl, Esther Straganz, Angela Wiedermann, Julia Wieger, which have been in circulation for days and also been made public now! Only a fraction of the initiators are still holding a membership of VBKÖ at all. The others resigned their membership under diffuse pretexts in the course of the General Assembly on June 27, 2011. Since in the last years and months, the participation of all these artists in the actual work of the Association was very little, their sky-rocketing and globally manifested interest in VBKÖ within a week´s time is amounting to surprise. With reference to the publicized list of demands the Board is replying that the initiators could long have put these into practice, which they had been invited to, being members of VBKÖ. For a long time, it would have been possible to elaborate concepts and to discuss them. In our opinion, the initiators, instead, are acting grossly negligently under the cloak of a democratic approach: An international smear campaign was launched against Rudolfine Lackner. The Federal Ministry of Education, Arts and Culture was contacted, the chief grant-giving authority in Austria. This being so, Austria´s first association of women artists in history (est. in Vienna, in 1910), as women-minded and feminist counterpart to the Viennese Secession and the Künstlerhaus, is at risk to get withdrawn every funding basis, and the successful organizational work of many years, to be destroyed all at once. This way, the precious historic rooms in Vienna´s city, which have been defended for years in seemingly never-ending legal proceedings – among others, there was an additional claim for the rent of € 1.6 million – are in danger of getting played into the hands of the real opponents we have in common, the property speculators. Democratic rights of codetermination, processes of decision-making and communication, information, accessibility and transparency have not only never been restricted, but they have also hardly been made use of by the initiators at all. At the last General Assembly on October 10, 2011, the articles of the Association where modified, among other things, to increase the chances of becoming a member of VBKÖ. The fact that Rudolfine Lackner has never opposed the “decentralization of power” is already demonstrated by the circumstance alone that Rudolfine Lackner offered her office for discussion and placed it at the disposition of two of the signers earlier this year. The present explosive mobilization by the initiating artists is opposed to the continuous organizational work of over 10 years. Measures have been and still are aimed at positioning VBKÖ – which had gone completely unnoticed by the expert world until a few years ago –, countering one-sided conceptions of (art) history by rediscussing its own history, making its archives available to the public, fighting for the cause that this organization of significance in terms of cultural policy and cultural history should remain in the historic premises, advocating a clearly improved situation when it comes to grants (which could stabilize the frail structures of VBKÖ), and in addition to that, facilitating a critical contemporary art program with the smallest budget means. 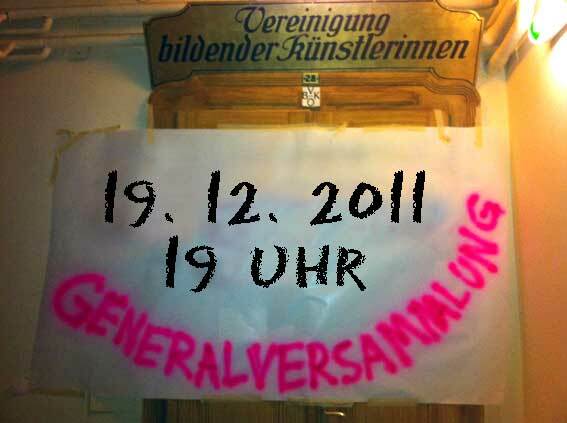 We are favouring the next General Assembly to take place on December 19, 2011, 7pm, at VBKÖ. The signatories of the demand for a general assembly welcome the opportunity for a general assembly on the 19th of December at 7pm. From the moment that the membership program was launched in 2010, the organization’s anniversary year, we were exuberant about this opportunity – particularly on the occasion of the centennial celebration – to take part in opening a space and program which had historically been repressed and closed for decades. We were happy to join the president in what was presented as such an opportunity. As the opening up of a historically repressed space was part of the mutual agenda, a growing frustration began to spread when a general lack of communication and transparency only increased following the inauguration of the centennial program and the membership program. For these reasons, and the reasons mentioned in the demand for a general assembly, it became pertinent that the space be opened to bring a public awareness of the situation taking place – after a general lack of communication, which reached a climax following the silence after the demand for a general assembly. • A decentralization of power does not mean expanding a discussion on the positions within a public institution to include two people rather than one. • Private invitation of membership, rather than opening the possibility to a broader public of women artists, is not the opening of the institution to new members. • Access to the statutes should not be a limited affair. • Being “erased” is an inappropriate way to end a membership term. • Legal proceedings cannot be supported nor empowered without transparency of their undertakings. • Only together can we get a broader public and broader funding potential – it is in no one’s interest to decrease or terminate financial or public support of any kind in any way for the VBKÖ, on the contrary. • The critical perspectives and development of this institution can and have only taken place in plurality. • Approaching the complex history of the space and its archives can only take place in plurality, but has not thus far. Thereby, we, the signatories of the demand for a general assembly, and continuing members of the VBKÖ – according to the organizational statutes – look forward to this opportunity for clarifying, opening, strengthening and expanding the important historical institution that is the VBKÖ. In addition, as a step towards greater transparency, we encourage the attendance of guests at the general assembly.